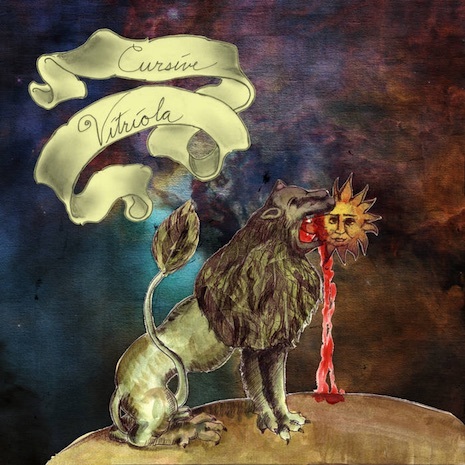 Cursive’s next album, Vitriola, comes out tomorrow on 15 Passenger. Early press for the new Cursive album, Vitriola, appears to be rather strong. The record drops tomorrow on the band’s label, 15 Passenger. Having listened to the album a few times I can add to the choir that this record is reminiscent of early Cursive. The songs certainly sound more cohesive and structured than, say, what we got with I Am Gemini, which is a complicated way of saying they have great guitar riffs, hooks and massive, percussive rhythms that consistently head in one direction, versus Gemini‘s proggy where-is-this-going approach. OK, let’s just get it out there — Gemini is my least favorite Cursive record. It’s difficult to get through. And I’m a sucker for big riffs and repeat choruses — i.e., straight-forward indie rock songs, like on this record. There’s a familiarity to this music that is oddly comforting. Both Noisey and Stereogum posted interviews with Cursive leader Tim Kasher that try to dissect the record’s meaning — true navel-gazing exercises that could be valuable to a Cursive superfan. My simplistic (and there’s no one more simplistic than I) take is that Kasher’s getting older and these songs reflect his anxiety about aging and/or the struggle and futility of life (versus say, songs about his struggles with relationships (Domestica) or religion (Happy Hollow)). There’s also a political theme that runs through a few songs that’s hard to miss, though I wouldn’t consider this a protest album. The Noisey article makes it sound like there’s a glimmer of hope underlying the collection. Maybe, but I don’t hear it. To me, it’s a collection of true bummers connected by massive riffs. But what else is new? All I can think of is how well these songs will sound live. For example, can Kasher get the crowd to scream along to the “Ouroboros” chorus: “I am a parasite / I am a shill / I am that lowly snake / Chasing its tail.” By god, I think he can. Which is good, because I have a feeling Tim and the crew are going to be touring this one for a long time. If you haven’t already, pre-order it here.